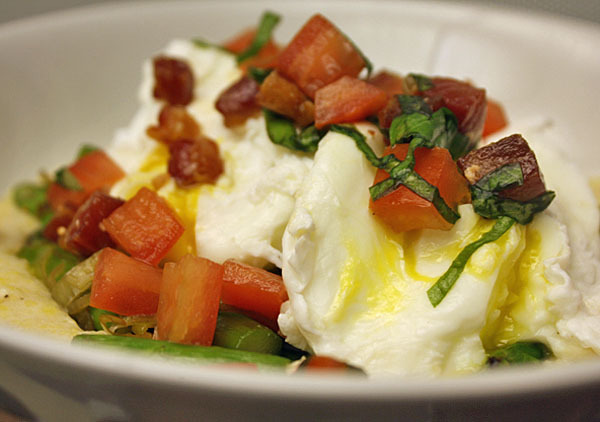 Here’s Week 26, Meal 2: Parmesan polenta topped with asparagus, leek and poached eggs with prosciutto, tomato and basil salsa. 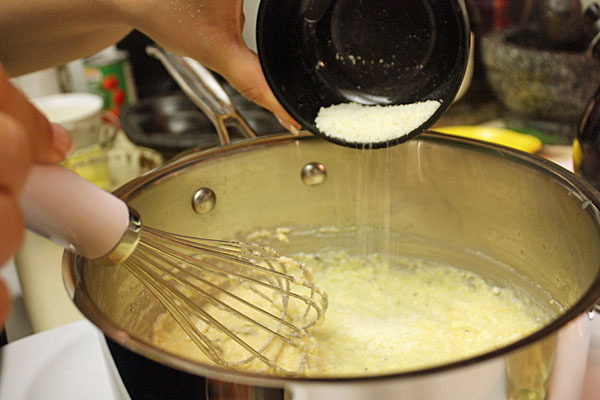 In a medium saucepan over medium-high heat, combine 3/4 c of low-fat or non-fat milk, 3/4 c of water, 1/2 t of salt and 1/4 t of black pepper for polenta. Bring to a simmer. Add 3 T of polenta, stirring constantly until it starts to thicken. Reduce the heat to low and allow to cook for about 20-30 minutes if using regular polenta or 3-4 minutes with instant polenta. When finished, add 1/2 oz. of Parmesan cheese. While the polenta is cooking (if using regular polenta), knock out the rest of the dish. If using instant polenta, simply time your components and tackle them in what ever order is comfortable to you. Start with the prosciutto. Drop the small dice on a thick 2 oz. of slice of prosciutto. Heat 1/2 T of olive oil in a small saute pan over medium-high heat. Add prosciutto and cook until the prosciutto turns a dark red color and gets crispy. Drain on paper towels and reserve. Knife work: Cut 1/2 lb. of asparagus into 1-inch. pieces and thin slice 1 leek. While you’re on the board, small dice 1 roma tomato and chiffonade 1 T of basil. 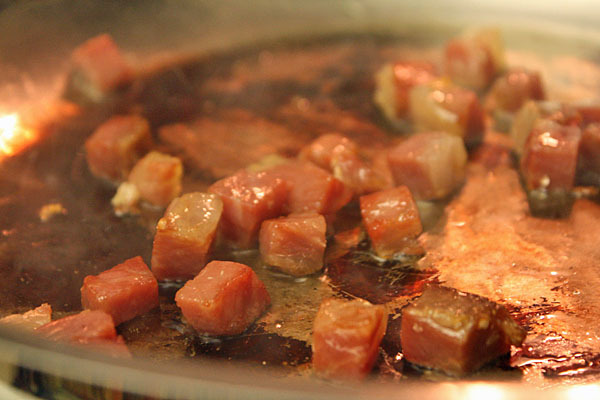 In a medium saute pan over a medium-high, heat the other 1/2 T olive oil. 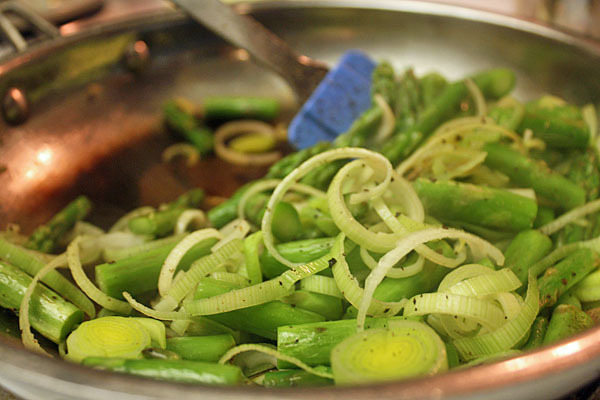 Add asparagus and cook for 1-2 minutes. Next, add the leek and cook until both are tender. Season with salt and pepper and reserve. 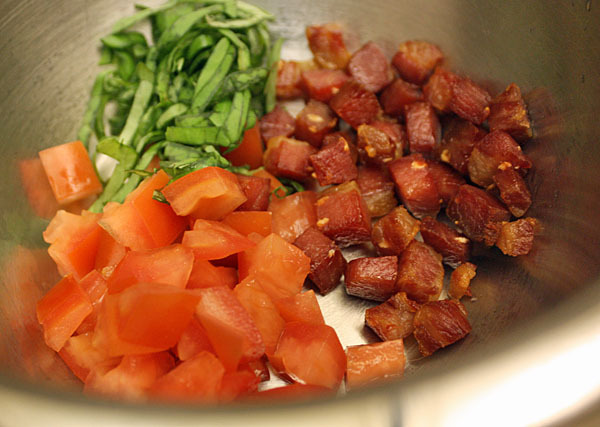 To make the salsa, combine the prosciutto, tomato and basil. Reserve. 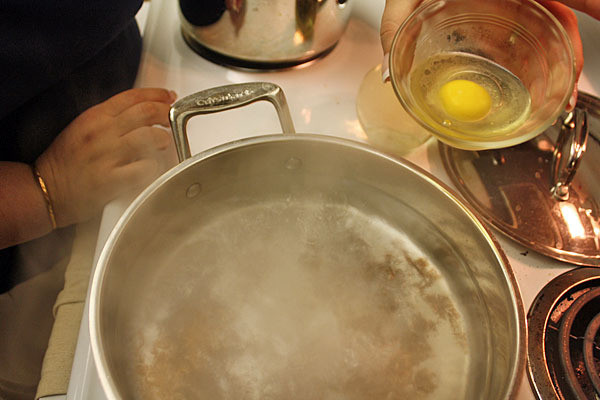 Before you’re ready to poach your eggs bring a medium pot of water to a boil. Add 1 T of vinegar and 1 t of salt. To plate: Split the polenta between two plates or bowls. 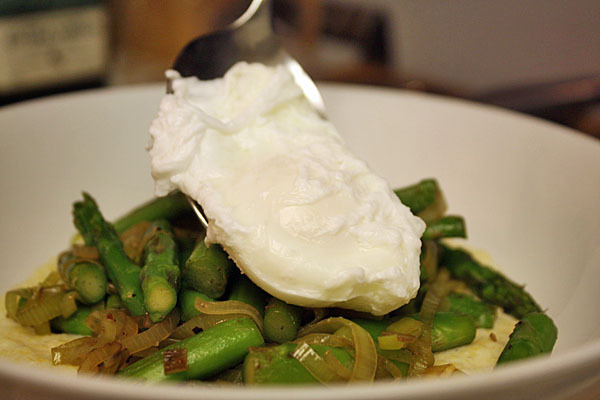 Top each with 1/2 of the veggie mixture and then two poached eggs. Finish off the dish with half of the salsa. I’m writing this post after eating the meal as my actual breakfast and I’m already thinking about making the polenta for dinner to go with some turkey Italian sausage and homemade pizza sauce in my fridge. The cheesy cornmeal is satisfying comfort food on its own, but the base gets elevated with the addition of the fresh asparagus and aromatic leeks. I love how the richness of the yolk, saltiness of the parmesan and vegetal earthiness of the asparagus play off each other. Finishing with the prosciutto — essentially meat croutons in this dish — put this one over the top.